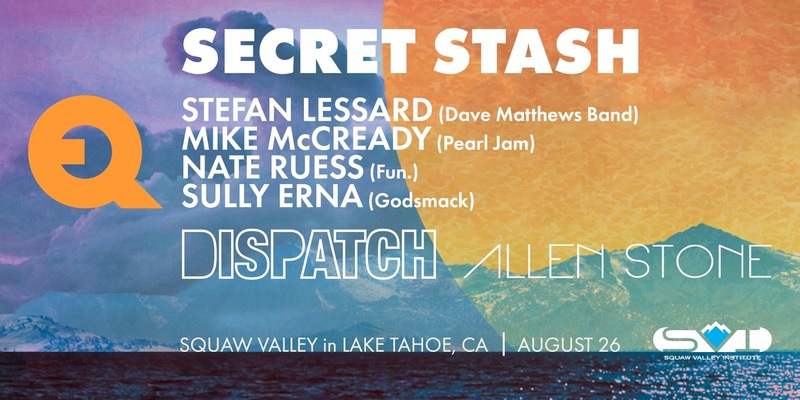 Creating Equilibrium has announced that Secret Stash, a band made up of Mike McCready, Stefan Lessard (Dave Matthews Band), Nate Ruess (fun. ), and Sully Erna (Godsmack) will be on stage for a concert at heir event at Lake Tahoe, August 26th. Tickets are available on their website. Anchored by Stefan Lessard from Dave Matthews Band and Mike McCready from Pearl Jam, this iconic duo will be joined by a “secret stash” of musical friends, including Fun.’s Nate Ruess, Godsmack’s Sully Erna, saxophone player Michael Ghegan, and many more—all in one of California’s most majestic settings: the base of the KT22 mountain at Squaw Valley. Joining them onstage will be special guests Dispatch. Fresh off the release of their celebrated sixth album, “America, Location 12,” the band returns to the road on their first national tour in five years. They will play their only California appearance at Creating Equilibrium. Rounding out the weekend’s list of musicians is R&B singer-songwriter, Allen Stone. The Secret Stash, Dispatch and Allen Stone concert will be open to the public, with general admission and VIP tickets available now!